Jackie Sibblies Drury’s Fairview opened at Berkeley Rep this past week. A co-commission of Berkeley Rep and Soho Rep, the play was developed in Berkeley Reps’ The Ground Floor program and premiered at Soho Rep in New York this past June. The play pulls out a number of theatrical forms and practices but melds them into a madcap and very illuminating look at black-and-white relations in this, the United States of America. Part of the difficulty of overturning the biased and dismal racial habits we all live under is the problem of presenting them freshly, so that they slide away from stereotype and cliché and recapture our attention and imagination. Only by doing so can the negatively concrete blocks of our culture begin to crack. (L to r) Natalie Venetia Belcon (Beverly), Monique Robinson (Keisha), and Charles Browning (Dayton) in Berkeley Rep’s production of “Fairview”. Photo courtesy of Kevin Berne/ Berkeley Rep. The play, which is one hour and forty minutes long with no intermission, begins in the solidly middle-class home of the Frasiers. Decorated shades of off-white, the living room is the setting for Grandmother’s birthday party. At the dining room table, the anxious and overburdened Beverly (Natalie Venetia Belcon) peels carrots. Everything must be perfect, but even so she takes out time to rock to Sly and the Family Stone’s “Family affair” using the carrot as a microphone. Her husband Dayton (Charles Browning) enters to tease and disrupt, but has he forgotten to buy the root vegetables? Disaster, if so. And soon sister Jasmine (Chantal Jean-Pierre) knocks at the door, all sass and competition as she sashays around the living room baiting Beverly while sipping rosé. 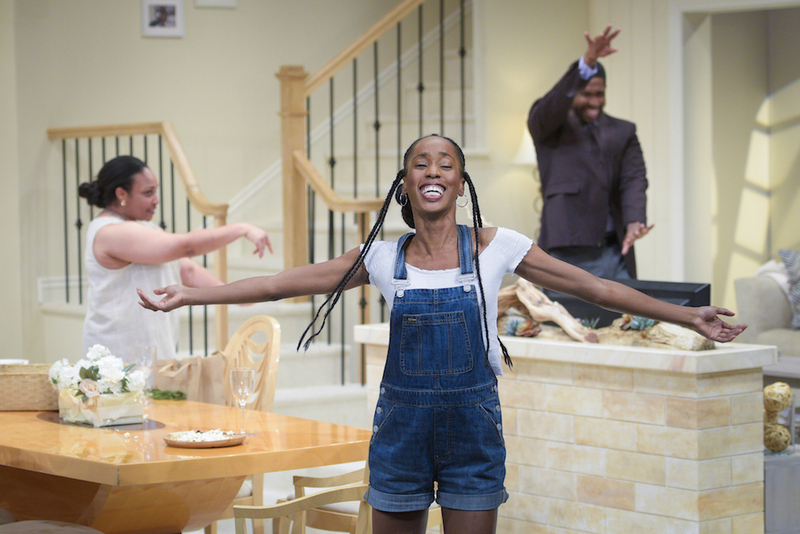 Beverly and Dayton’s adorable daughter, Keisha (Monique Robinson), returns from basketball practice, hoping to enlist her aunt into convincing her mother that she should take a gap year for travelling before college. And will Beverly’s lawyer brother, delayed while traveling, make it to dinner on time? It’s all wholesome and funny, and as light as a down feather escaped from the ecru pillows decorating the sofa. Until Beverly collapses. The lights cut out, and when they return the family is replaced by stage crew tidying everything back to where it was at the beginning of the play. Once the stage crew leaves the set, Beverly returns to begin peeling carrots. Soon it’s clear that the entire first scene is being re-enacted, exactly as before, only this time there are no voices. Beverly opens her mouth and, although she mimes speech, nothing is said. Ditto Dayton, Jasmine and Keisha. The lights on stage are dim, and the audience watches the action through the proscenium as if through a glass darkly. As we watch the interactions we are now familiar with, there is a salient change: four people doing voice over, and more to the point, four white people discussing what we have just watched. Are they speaking what some of us thought as we watched? Or what? The observations, which are always, insidiously, indirect evaluations and judgments, rise in tempo and heat as they continue on. Until at last there is only one man railing on, in fear and anger, his voice rising, his thoughts increasingly messy and irrational. And, suddenly, we are at the birthday dinner, the table sagging under an absurdity of food, including roast boar. Now is the time for Grandma’s entrance, the diva for whom all this ample perfection has been created. Beverly calls out and, under a rosily exuberant spot light, Grandma (Brooke Bloom) enters. Whoa. Grandma is White. And so is Beverly’s tardy brother (Luke Robertson), and Keisha’s bizarrely androgynous basketball mate (Jed Resnick). And then there is another Grandma (Natalia Payne). These four are clearly the four of the voices over, the commentators who have now infiltrated the family in many not so funny ways. Chaos increases, and the play staggers rapidly toward mania. Then Keisha steps forward to speak, not to the other players, but to us, the audience. Sorry, I can’t reveal the end. No, spoilers here. Far better you scurry on over to the theater to enjoy this funny but sharply relevant new play. Fairview continues at Berkeley Rep’s Peets Theater through November 4. For tickets and information, visit berkeleyrep.org.